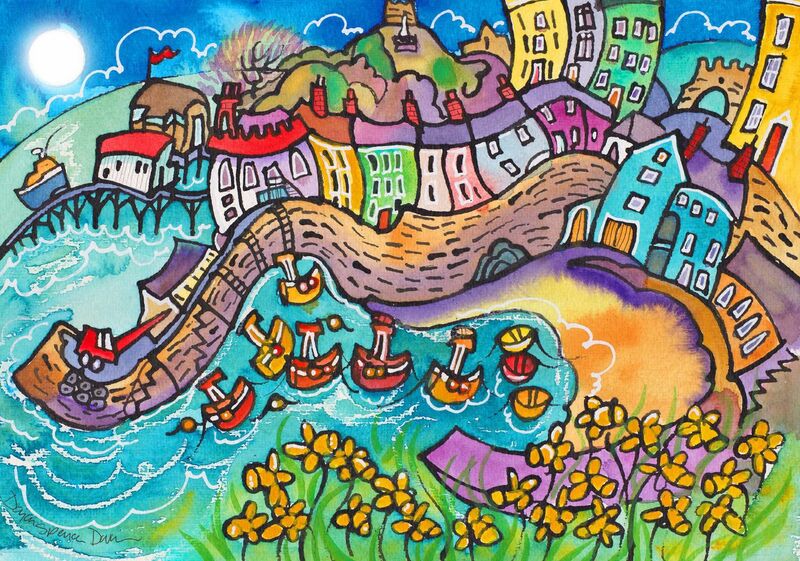 To be shown in the White Lion Street Gallery in Tenby are, new from Dorian Spencer Davies’ studio, 40 original paintings of Tenby, Saundersfoot and other parts of South Pembrokeshire that formed the backdrop to his early years. Though he now lives ‘away’, his affection for and knowledge of the area is undiminished. 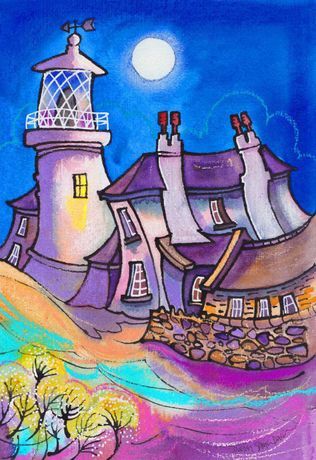 There is rarely a straight line in the work as he carefully and colourfully curves harbours, houses, coastlines and clouds to make harmonious designs of well-loved views. 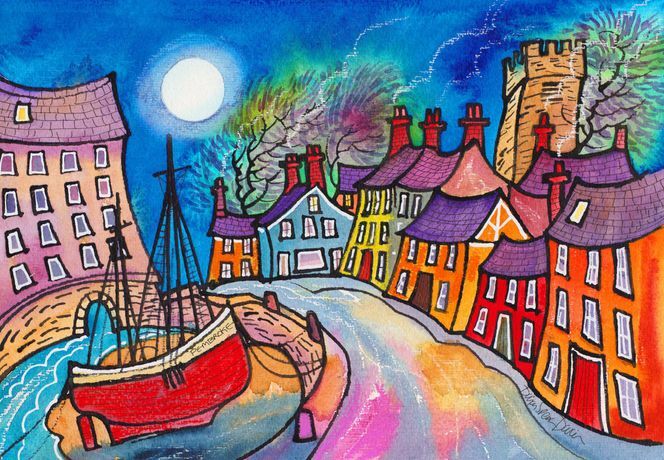 Using watercolour and ink, Dorian’s work has evolved into an instantly recognisable style. His background in illustrative work, from college through to children’s book design for many years, is underpinned by skilful drawing, acute observation and judicious editing of the extraneous but with the addition of clever details. This exhibition is his fifth one man show in Tenby, Dorian having shown his work at the White Lion Street Gallery since 2001. He regularly contributes to mixed exhibitions and shows his work in galleries across Wales. Last year he was won a commission for producing 5 large panels for the Hean Castle estate, permanently on show in the Visitors’ Centre at Coppet Hall. The Port Authority in Milford Haven also asked him to design large scale work for them in the same year, including personal appearance and demonstration. Dorian is pleased to undertake smaller commissions for paintings to commemorate special events like weddings and birthdays, and to incorporate personal messages hidden within the work.